Simha, P., Senecal, J., Nordin, A., Lalander, C., Vinnerås, B., 2018. 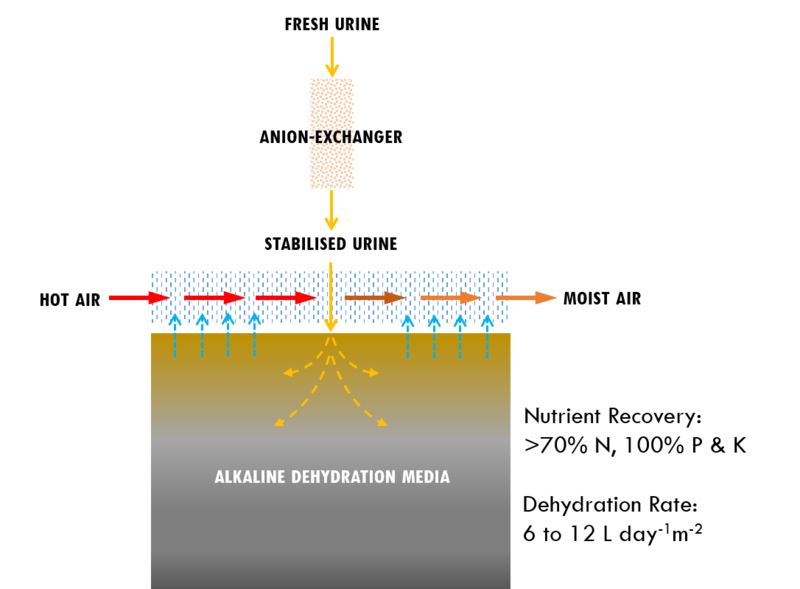 Alkaline dehydration of anion–exchanged human urine: Volume reduction, nutrient recovery and process optimisation, Water Research. In Press. doi: 10.1016/j.watres.2018.06.001. The study investigated three aspects: (i) can urine be alkalised to stabilise urea-N by using an ion-exchanger? (ii) can alkalised urine be dehydrated? and, (iii) how can the urine dehydration rate be optimised? The study demonstrated that, by exchanging chloride ions in urine with hydroxide ions, urine can be alkalised and stabilised, thus facilitating its storage or pipe transport. The alkalised urine was dehydrated in three different treatments, resulting in drying rates between 6 to 12 L of urine per day in one square meter of either wood ash or KOH-doped biochar. The treatments resulted in appreciable nutrient recovery from urine: >70% N, and 100% P and K. The study also developed a cubic response surface model to optimise the dehydration rate of urine in wood ash. To acheive high degree of nutrient valorisation, the study proposes combining source–separation of human urine with alkaline dehydration.